Mom's Gone Bronson! : Pro Flowers Review! Just before Easter I had a wonderful opportunity to purchase a bunch of GORGEOUS flowers from Pro Flowers, in order to share with you their service and a little of what they have to offer! I have to say that I have not used a mail order flower company in YEARS because I usually pick up arrangements, and gifts, myself but I love the idea of making someone's day with a nice, fresh cut bunch of flowers or gift to let them know you care and this is where Pro Flowers know how to service you best! It took an age to search through their site to find the perfect flowers for the occasion (Easter in this case) because there were just SO MANY beautiful arrangements to choose from! 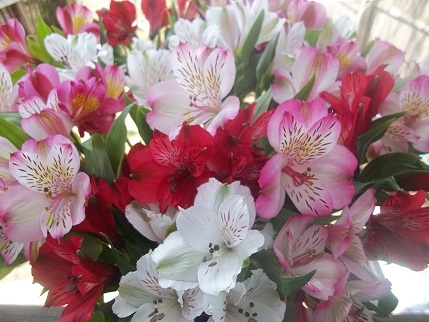 One eventually caught my eye though, which I kept on going back to and just had to pick up - Peruvian Lilies in a double bunch with 200 blooms! Regularly $39.99 for a bunch of 100 blooms, the Peruvian Lilies were 50% off with a coupon I discovered by searching through Google! I picked up the 100 blooms for $19.99 but for just $9.99 more I also picked up a second batch of 100 blooms and hence my 200 blooms for a staggering, bonus price of just $29.98! You will be able to catch this dead by clicking HERE (good at the time of posting this article, but prices and deals/coupons may be subject to change at any time!). To be sure to have enough space for all of these blooms I picked up a cute purple vase as an add on for my flowers, which was $12.99 (vases and colors and prices vary) and further added a Lavender bath collection set for another $9.99! 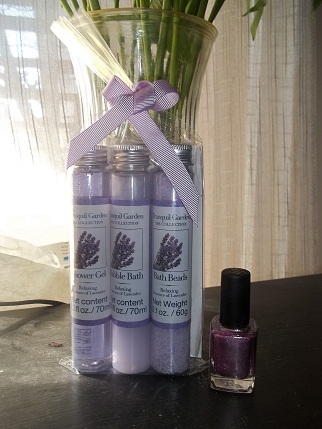 (Pictured to the right with a nail polish for size reference - mail polish NOT included with package). My total for 200 Peruvian Lilies, a vase, lavender bath set and shipping was less than $65 in total, which is a fabulous deal on a floral delivery! They were also delivered within 2 days of placing the order! You just can't get much better than that! When the flowers arrived we were 4 days shy of Easter Sunday, which I had planned on purpose assuming that the blooms would not yet be open and would need time to come to life before giving some to my MIL for the dinner table, and...I was right! The blooms turned up in 2 separate bunches, which made them easy to cut and prepare and delicately arrange in both their new vase and an older vase I had lying around the house! 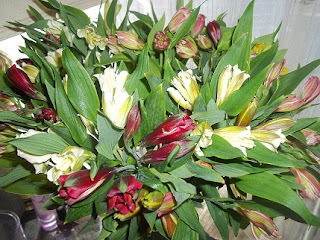 They advise that they will start to open and bloom within 24 hours and they certainly did that! By the end of day 2 they just looked AMAZING and so, so pretty! (See photo, above left, of blooms on arrival and, bottom left, upon opening/blooming in the days after). 3 days following the stems arrival, I cut them down for a second time and fed them a little more plant food and they were good to go for Easter day! 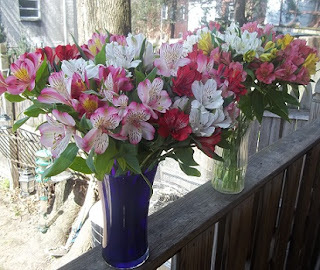 We gifted some to my MIL and to my step son's mother as a little home made gift from him in a little coke bottle with a simple ribbon - it made his day to go home with something for his mother and it made my MIL's day to receive a pretty bunch of flowers for the table! Of course I kept the second bunch for myself and they have brought joy to my room for over 2 WEEKS!!! In fact, it is day 16 today and they still look amazing, even though they are starting to wilt a little now and will probably only be around now for another day or two, but I am thoroughly impressed with their longevity and you really can appreciate that for the price when many bunches of flowers only last a little less time! Overall, I have to say that Pro Flowers has met, and then exceeded, my expectations! I am thoroughly impressed with the quality of the product, the quickness of the delivery and the cost in total! I am just delighted to be able to share these with you and to let you know that Pro Flowers gets a BIG thumbs up! Remember, Mothers Day is coming up just around the corner and perhaps this post will give you some ideas for gifting to a rather happy mother! Have you ever used a flower delivery service before? What did you think? I would love to hear your thoughts!! Disclaimer: Pro Flowers allowed me a total of $65 to spend across their site in order to write this review. This did not in any way influence my feelings of thoughts on their site, products or service. My opinions are open, honest and 100% my own based on my experience with my order. Your opinions may differ. Thank you! Those are nice flowers! Thanks for the info! Those are beautiful! I need to start looking for Mother's day! So beautiful! I love the vase! Peruvians are such a beautiful flower for Spring! Those are beautiful and gosh you got a ton! Red Jacket Orchards Juice Review! FREE SAMPLE of Mio Fit! DaVinci Gourmet Syrup Review! YUMMY! EARTH DAY FREEBIES and DEALS!